Originally published in 1926, King Goshawk and the Birds is the first installment of O’Duffy’s Cuanduine trilogy, which also included The Spacious Adventures of the Man in the Street (1928) and Asses in Clover (1933). Set in a future world devastated by the development of capitalism, King Goshawk concerns the eponymous tyrant’s attempt to buy all of the wildflowers and songbirds in Ireland, and the attempt by a Dublin philosopher as well as a number of mythical heroes of Irish tradition to stop him. 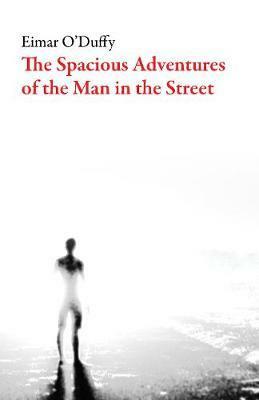 In the second volume of Eimar O’Duffy’s Cuanduine trilogy (the first, King Goshawk and the Birds, was reissued by Dalkey Archive in 2017), we meet the “man on the street,” Aloysius O’Kennedy, an erstwhile grocer’s assistant who has been transported against his will to the city of Bulnid on the planet Rathé—a kind of egalitarian paradise of which O’Kennedy wants no part. 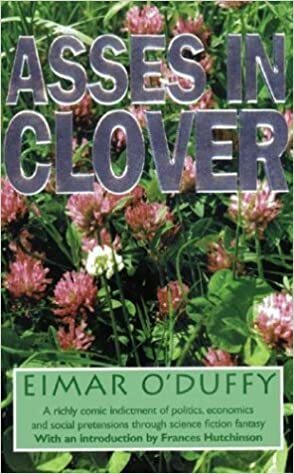 His Gulliver-like adventures among these otherworldly idealists (all recounted in great detail to his former employer the grocer, in an effort to explain his long absence from work) are the subject of this sui generis novel, which demonstrates again that Eimar O’Duffy is an Irish writer like no other. This comical science fiction fantasy, written in the 1930s, offers a historical critique of politics, economics, social pretension, and globalization. The novel is the third in the Cuanduine trilogy, a series of science fiction works that challenge the "Procrustean remedy"--the adaptation of society to the paid employment system--and cite modern capitalism as the root of society's problems. In this volume Cuanduine, the mythical hero of this trilogy who is brought to earth to right the wrongs perpetrated by capitalists, turns his fury against the media, mainstream economists, and ordinary people who seek narrow, short-term, self-interested ends. 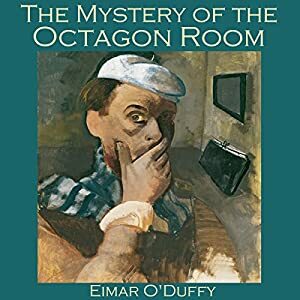 Eimar O'Duffy, The Mystery of the Octagon Room, audio-book, 2017. The Mystery of the Octagonal Room is a story about a man who is invited to a remote country house, recently inherited by friends of his. Many of the rooms in the house are rumoured to be haunted. But an unassuming octagonal room in the tower hides a particularly gruesome and terrifying secret. Nobody can stay there overnight - and those who have tried it were insane by morning. The narrator of the tale cannot resist the challenge and orders a bed, lamps and an oil stove to be installed in the Octagon Room, so that he can put the tale to the test. Eimar O'Duffy, The Lion and the Fox, Leopold Classic Library, 2018. 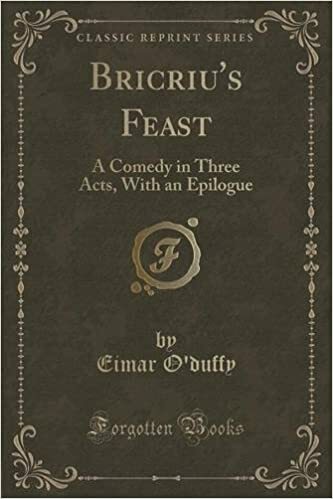 Eimar O'Duffy, Bricriu's Feast: A Comedy in Three Acts, with an Epilogue, Leopold Classic Library, 2017. Eimar O'Duffy, The Wasted Island, Andesite Press, 2015. 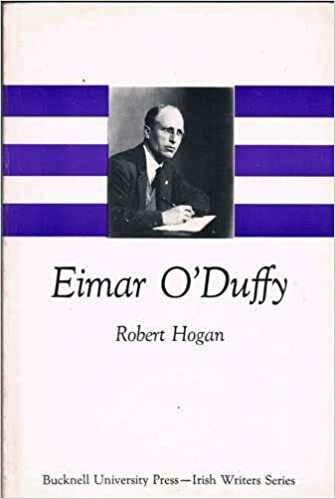 Eimar O'Duffy’s The Wasted Island (1919) is one of the earliest literary critiques of the Rebellion of Easter 1916. As with the other war novels, there is much worthy conversation and debate about the pros and cons of the rising, the thinking behind it and, for O’Duffy, the disaster of its coming to pass. 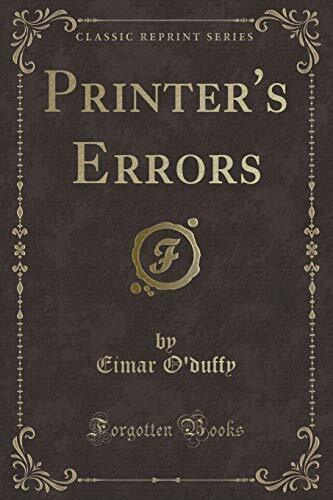 Eimar O'Duffy, Printer's Errors, Andesite Press, 2017.